The Latin Percussion Cow Bell Collect-A-Bells Black Beauty allows you to express your distinctive style. 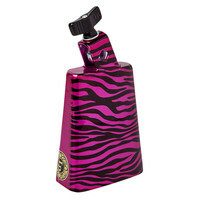 The 5-inch mountable Collect-A-Bells will add a wow factor to your drum set or percussion rig with its striking Purple Zebra design. Mounting is secure and easy with the LP forged eyebolt assembly which grips tightly to any 3/8″ diameter rod. LP Collect-A-Bells have a high pitch with a bright sound and moderate overtones and every strike of the slightly rounded playing surface projects exceptional sounds. This entry was posted in Latin Percussion and tagged Drums-and-Percussion. Bookmark the permalink.